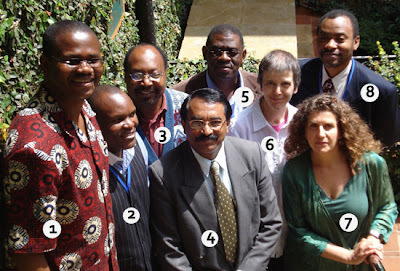 CARTA's Board of Management (BoM) held its inaugural meeting in Nairobi from June 1 to June 3, 2010. In his welcome address, CARTA's Director- who is also the Executive Director, APHRC - Dr. Alex Ezeh, said the inaugural meeting marked the full "activation" of the CARTA governance structure of which the BoM is the highest organ. The BoM comprises of representatives from seven partner institutions nominated by members of the Consortium to serve on the Board. The seven institutions on the inaugural board are APHRC (the host institution), the University of the Witwatersrand (the co-host), University of Ibadan, National University of Rwanda, University of Malawi, Ifakara Institute, and University of Warwick. Noting that the board was made up of busy people, Dr. Ezeh enjoined BoM members to show commitment to CARTA. Although enormous challenges lie ahead, Dr. Ezeh said, he was confident the board would help CARTA fulfill its mission. CARTA Deputy Director, Professor Sharon Fonn, praised the initiative reminding BoM members why CARTA had become necessary. CARTA sets out to ensure that universities in Africa can train teaching and research staff at the doctoral level through programs that are internationally competitive, and can produce graduates that are world-class.While the first set of graduates supported by the program would emerge within four years, Prof Fonn pointed out, the full realization of the CARTA vision would take up to 20 years. One of the first tasks the BoM had was the election of the chair. Prof. Akinyinka Omigbodun of the University of Ibadan was elected to the position and immediately assumed office.The Head of Finance and Administration at APHRC, Mr. Joseph Gichuru, attended the meeting to provide CARTA's financial position as well as enlighten the BoM on requirements from the funding institutions.On the agenda were other issues including upcoming nominations from partner universities for CARTA fellowships, the Joint Advanced Seminar (JAS) series training program for the fellows, and training for supervisors and other staff. The BoM members also received reports on and extensively discussed CARTA's Monitoring and Evaluation (M&E) framework. They were informed that Wellcome Trust (WT) had appointed Rand Corporation as the External M&E consultant for WT's funded aspects of CARTA.